Hey everybody. I wanted to tell you that I've sold 250 copies of Working with Stories. Hooray! The average U.S. nonfiction book is now selling less than 250 copies per year and less than 3,000 copies over its lifetime. There are somewhere between 600,000 and 1,000,000 books published every year in the US alone, depending on which stats you believe. Many of those – perhaps as many as half or even more – are self-published. On average, they sell less than 250 copies each. It’s estimated that the average self-published print book sells around 250 copies over its lifetime. [T]he average number of [self-published] books sold is often said to be a figure like 100, 250, 500, or 650. ... That’s lifetime. So the "250 copies in its lifetime" estimate was correct ... for self-published books. Measured against that average, Working with Stories is doing very well. I have no idea how long the book's "lifetime" will be, but I would hope that it will stay reasonably current for at least five years. How is the book doing on making money? I paid my indexer $3000 to produce the index at the end of the book (after she very kindly cut her rate in half to help out). Adding up print and Kindle and PDF and direct sales, I've made about $2500 on book sales since last May. So in another few months, I might actually start to get some compensation for the two and a half person-years (I estimate) I spent writing the book! That's exciting. Has the book been a success in helping people work with stories? To answer that question I need no calculator. I am sure of it, because of all the emails I have received over the past seven years. Ever since I wrote the book's first edition in 2008, I have regularly received emails thanking me for writing the book and telling me about the many ways in which people are making use of it. Money aside, that's exactly what I wanted to happen. But that's enough about me. The main reason I wanted to write this blog post today was to thank you. If you bought a copy of the book, thank you. If you gave me feedback on the book, thank you. If you encouraged me to keep going, thank you. If you helped with the work the book is based on, thank you. If you hired me on a project so I could learn what I wrote in the book, thank you. If you talked to me about stories and story work, thank you. I couldn't have done it without all of you. In honor of this milestone, I thought I'd show you a funny picture I made last year to promote the book (but decided it was too silly to use). At my house, everybody reads Working with Stories. Anyway, thanks again for all your help. Here's looking forward to more good work in the future! Somebody once told me that somebody else said something interesting about me. "Keep your eye on her," they said, "She's a crackerjack." I've always wondered what that meant. Am I a confection or a conflagration? Can I be both? Is there a prize? Here's a joke my dad used to tell. On the wedding day, as soon as the ceremony was over, the bridegroom rushed up to his father-in-law. "You told me that when I married your daughter I'd be getting a prize," said the bridegroom. "Where is it?" So anyway, last week I realized that the clutter in my office had once again reached a post-apocalyptic level. I decided that on Monday I would stop and clean. Monday did not cooperate. It rained all day, which meant that my usual practice -- taking all the junk outside, vacuuming and dusting, then finding a new way to squeeze all the junk back in again -- wouldn't work. So I fell into looking through a stack of old notebooks. 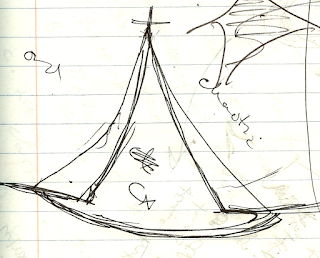 I found a bunch of interesting things I had forgotten about, and I thought, "I wonder if the readers of my blog might also find these things interesting, in an archaeological kind of way." So I scanned in some pages to show you. 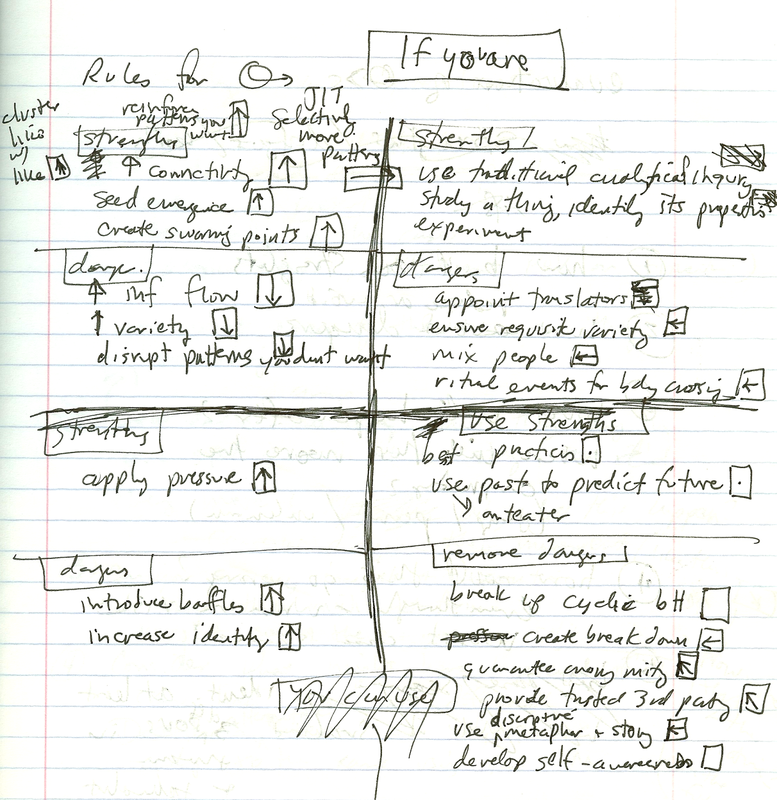 To anyone who is interested in my early work on sensemaking with the Cynefin and Confluence frameworks: here you go, have fun. To anyone who has no idea what I'm talking about: come back next time, because this is going to be boring. So I started carrying around paper notebooks. I did most of my thinking in them, and I had them with me for nearly every discussion and meeting. I have a series of nine of these notebooks, starting in May 2001 and stopping in late 2003 (when I stopped traveling because I had a child). 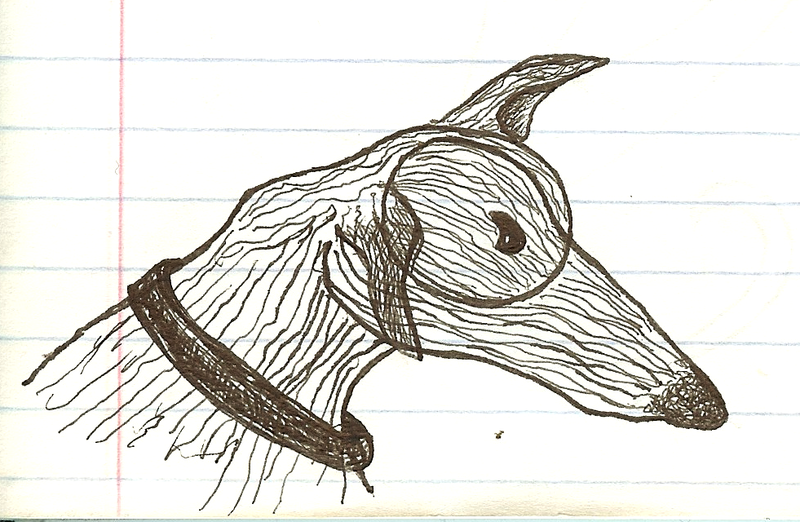 I seem to have lost the April 2001 notebook, sadly. I may have put it into the "to file" pile, which fills up five boxes. I have lots of stuff on the computer, too, but these hand-written notes are somehow more interesting to look at, because they're more of-the-moment. I promise I've kept myself to a bare minimum, and have thought about what you might want to see, and not just what I feel like reminiscing about. Mostly. First movements. May 16, 2001. 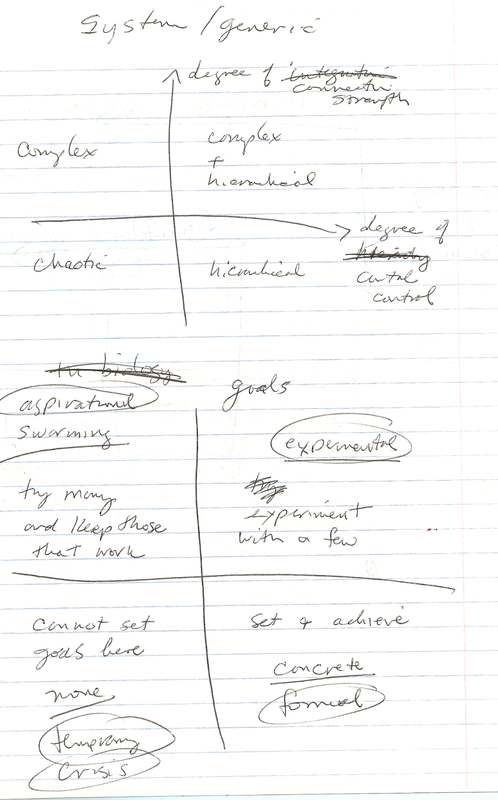 One of the first things in the first notebook (I can find) is this hint of movements-to-come on the Cynefin framework. 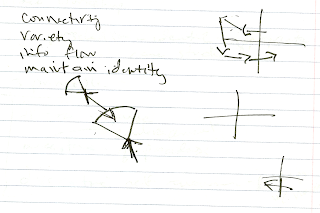 It says: "connectivity variety information flow maintain identity"
First bubbles. May 16, 2001. 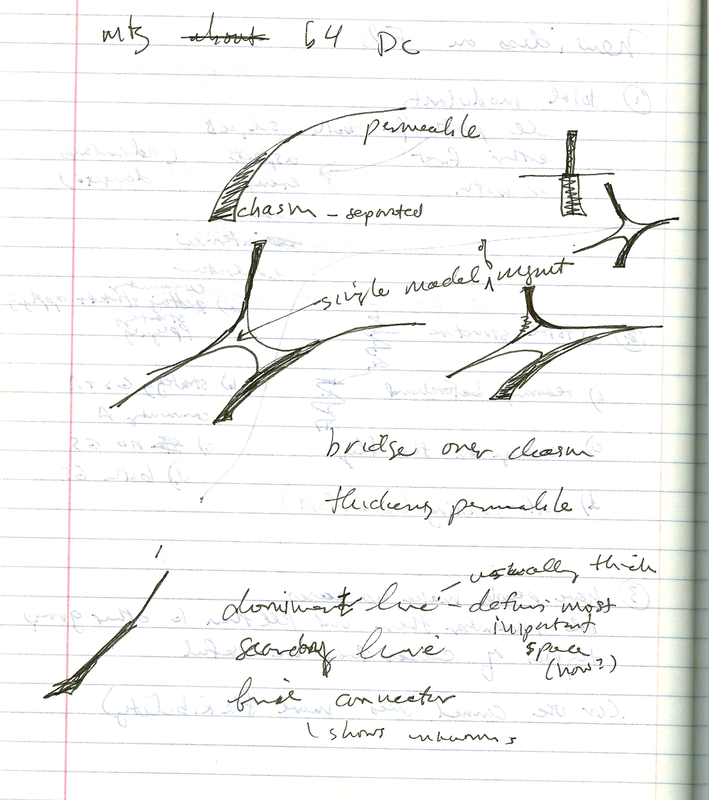 This was, I believe, the very first drawing I ever made of the "neuronal" or "bubble" form of Cynefin. 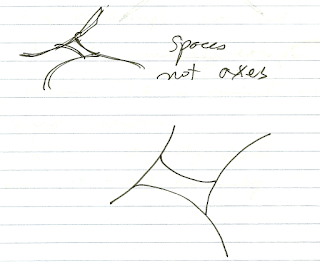 It says: "spaces not axes"
I remember very well when this happened, for some reason (who knows why we remember some things and not others). We were at a hotel in New York City, at an IKM workshop. It was before the workshop started or in a break. We were in one of those huge hotel meeting rooms, in the front left corner of the room, in front of an easel with butcher paper on it. I was going on about how it didn't matter that you said something wasn't a 2x2 model when people could look at it and see that it was a 2x2 model. 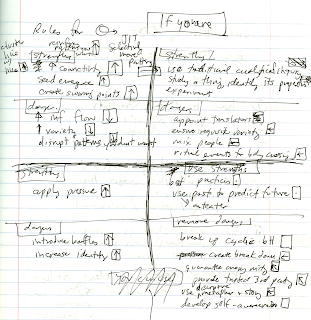 I said that if you lay out a space and give it dimensions, people will see it as a graph no matter what you call it. 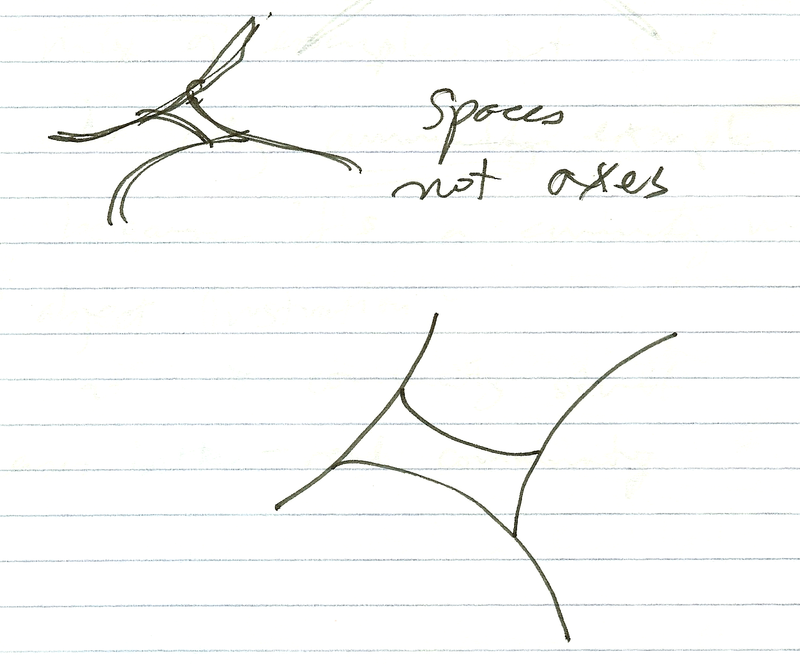 I said that if you want to talk about states, you need a diagram, not a space. So Dave said, "What about this?" 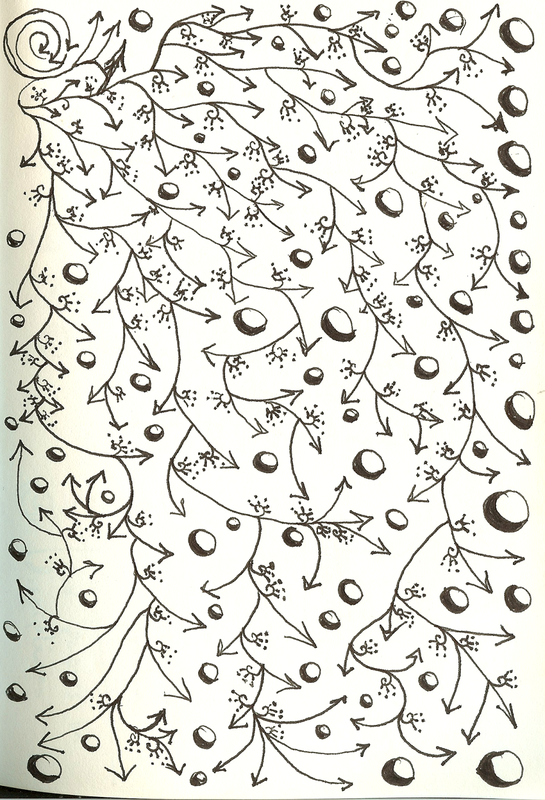 and drew the bubbles. 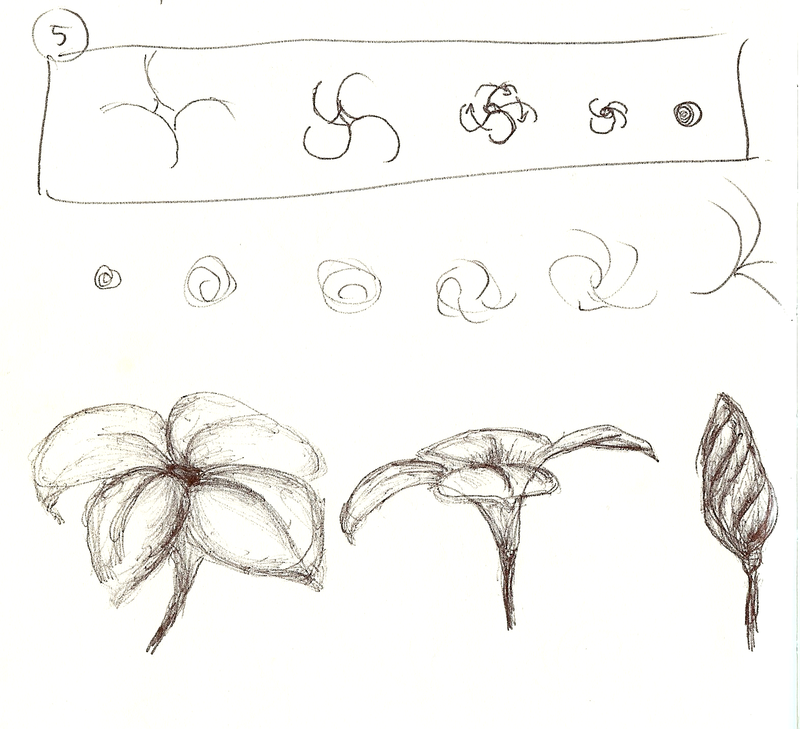 I think I copied the drawing into my notebook right away. Did I like the bubbles? Not really. 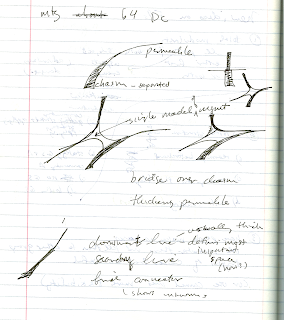 By then I was already enamored of my continuous-space model (which became Confluence), and everything else seemed worse. But I liked the bubbles more than the four quadrants. Lots of domain names. May 18-24, 2001. These two pictures are just to show you that we were working through many possible domain names (not internet domains, just spaces on the model) for Cynefin at that time. 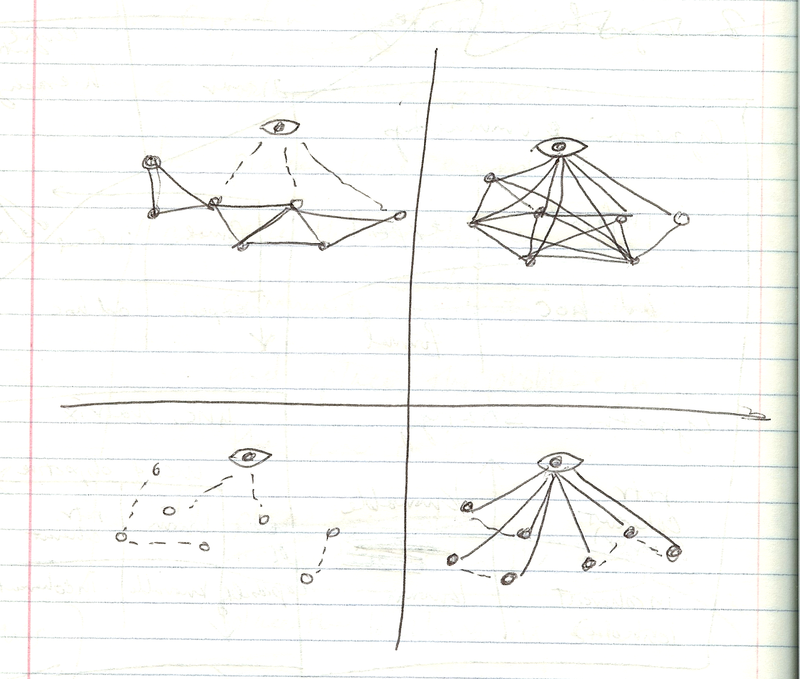 The top model says "understanding" and "known/knowable/retrospectively coherent/incoherent"; the bottom model says "community" and "bureaucratic/expert/shadow/temporary"
The top model says "system" and "hierarchical/complex+hierarchical/complex/chaotic"; the bottom model says "goals" and "formal/experimental/aspirational/crisis"
We played with the idea of having several models with different sets of domain names: for communication, culture, strategy, oh, lots of things. One file from that time lists 38 separate sets of domain descriptions. Why did we switch to using only one set of names? My best guess is it was a result of discussion and testing in workshops (of which there were at least a few more, if not several). But I don't actually remember. Intermission. 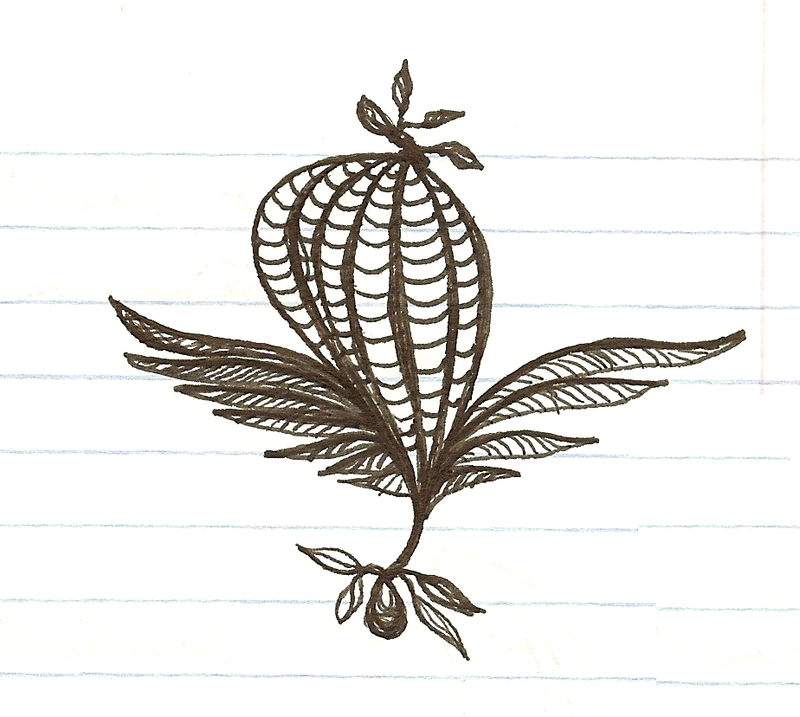 Here's a doodle to rest your mind. As you can see, the pyramids weren't exactly pyramidal at first. 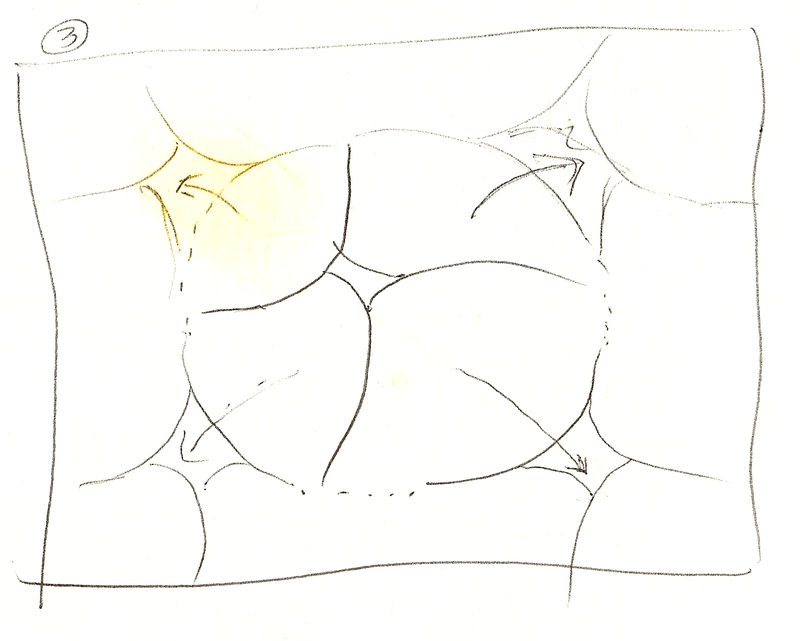 It says "chasm-separated" going to "permeable"; "simple (single?) 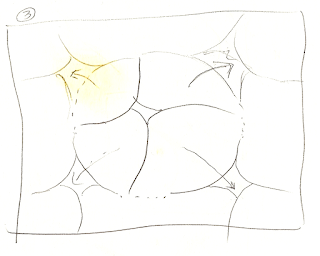 model of management"; "bridge over chasm"; "thickening permeable"; "dominant line, usually thick, defines most important space (how? )"; "secondary line"; "(final?) connector, shows unknowns"
Note also the arrow pointing into the empty spot between the bubbles. 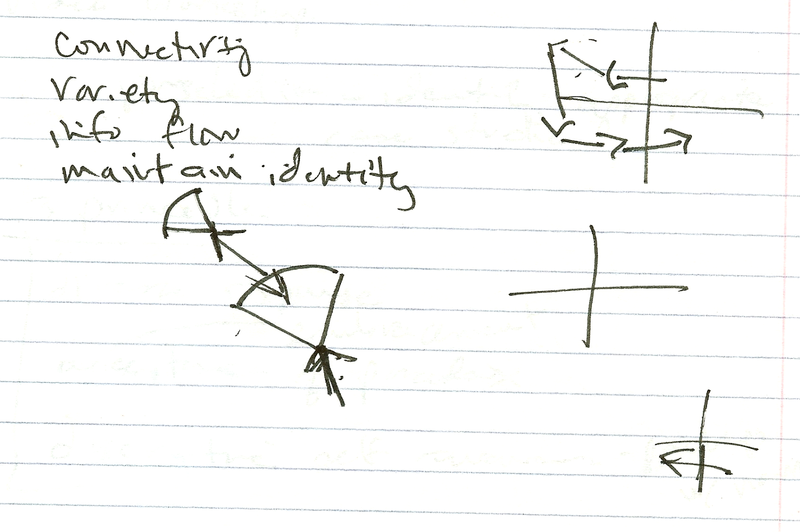 I think it says, "Simple model of management." Or it could be "single." 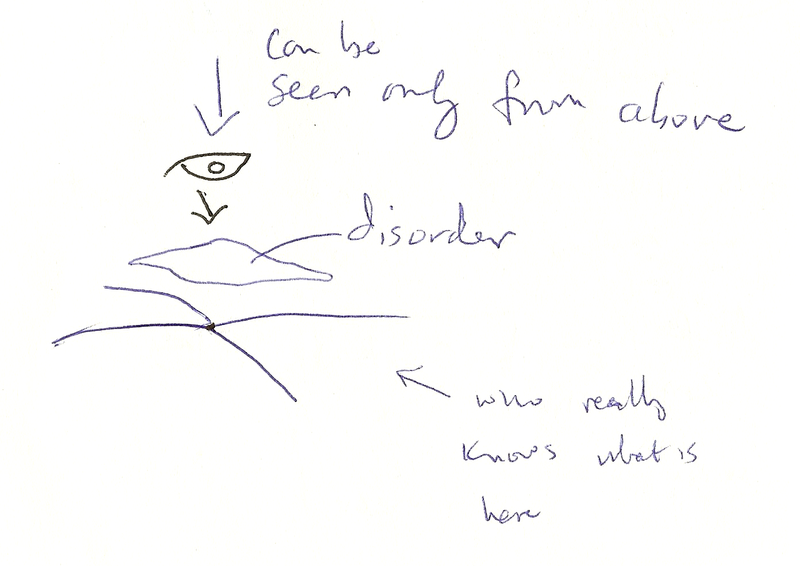 Anyway, that part was Dave's idea, and it evolved into the "disorder" domain. 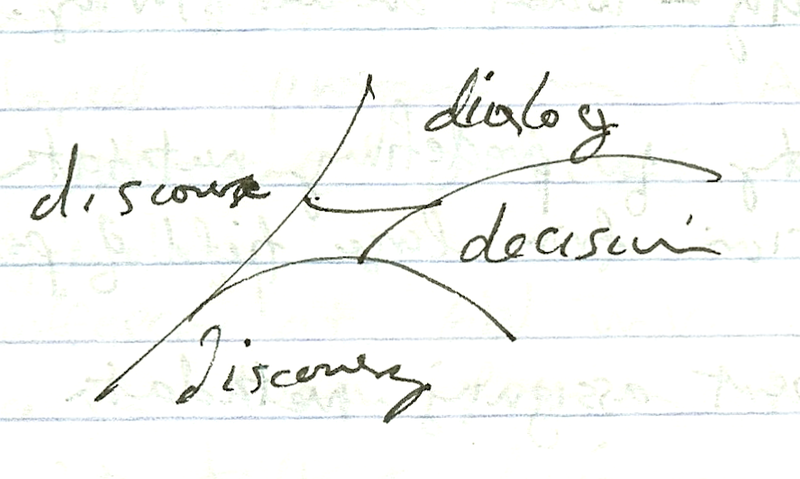 Decision dialogue discourse discovery. May 18-24, 2001. As I said, we were playing with lots of names for things. I like this set. 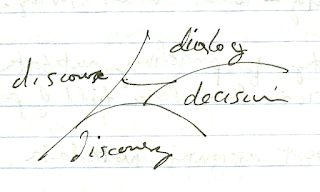 It says: "decision; dialog; discourse; discovery"
If you are (rules for interactions). Early June, 2001. 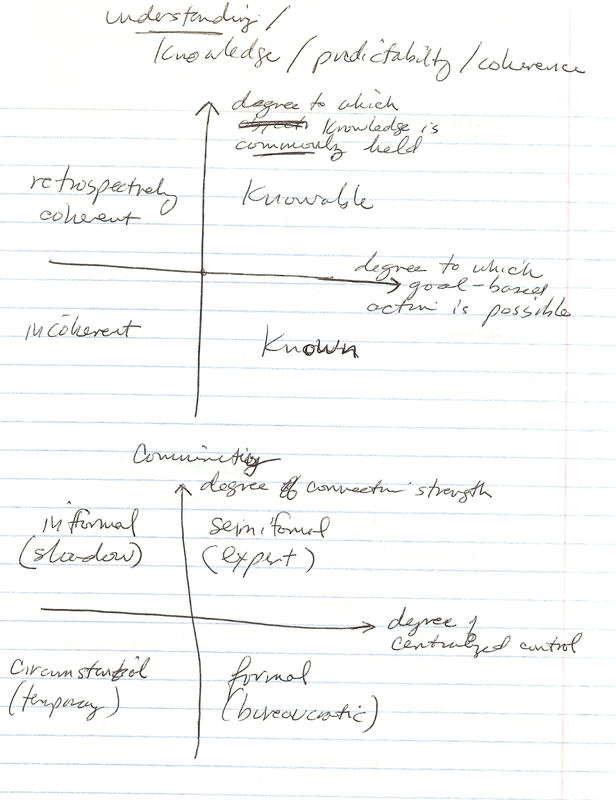 I just like this diagram because it sums up a lot of my/our thinking at the time. It says: too much to type here. 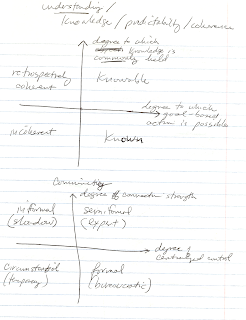 For each quadrant (the bubbles were not yet a sure thing), I listed strengths (more like opportunities) and dangers. 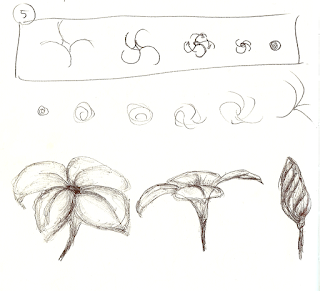 (I had a pretty involved (made-up) shorthand at the time, to write more faster. 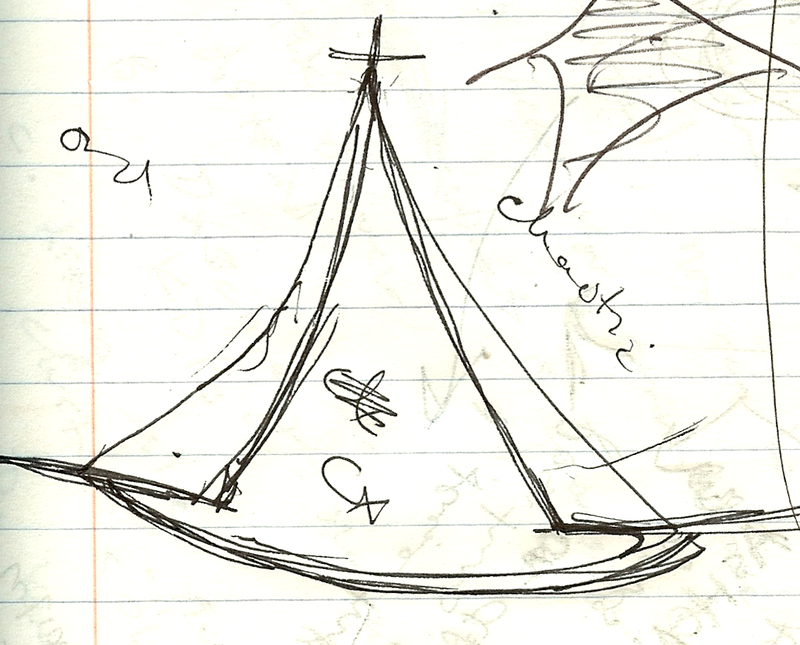 A circle with an arrow through it meant interaction; an up arrow meant increase; etc.) 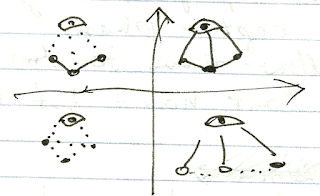 I think the boxed arrows represent things you should do in response, and they move you to another quadrant (or increase the intensity of the quadrant you are in, depending on where they go). More on the middle. November 15, 2001. Here's another mention of the middle space. I don't think it had a name yet, but the idea was there. It says: "In middle spaces - bureaucrats, experts, networks (? ), crisis managers - want them to be in that space"
It says: "hexagons on grid dimensions between extremes; then draw lines to create cynefin. this is new?" Note how I say "This is new?" I think this could only mean that I hadn't heard it before. I'm not surprised, because that sort of thing happened often. As with the bubbles, I would point out a flaw in something, or make a suggestion, and then a few weeks later Dave would suddenly come out with something new. It worked the other way around too. That's how people collaborate. 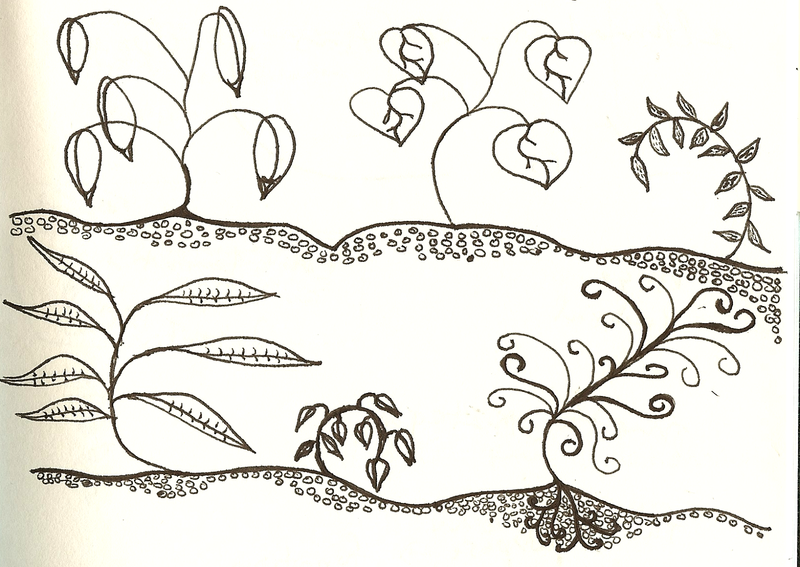 Doodle time. Here you go. Relax. The chasm returns. Sometime between May and September 2002. Here's a picture of the chaos-order chasm again. I know this was during a discussion with Dave, because his version of it is right underneath this picture, on the same page. It says: "order; complexity; chaotic"
Notice how it says "cx" inside the chasm. 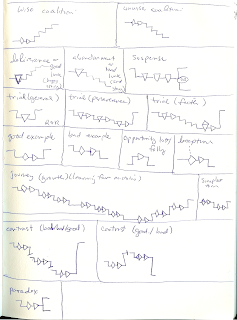 That was my shorthand for complexity. It's strange that I would think to put complexity in there. Maybe it had to do with people talking about the "edge of chaos"? I don't think that way now. 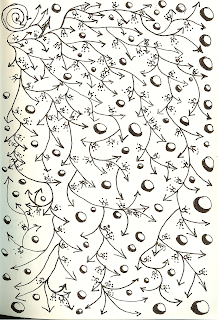 I think of complexity and chaos as orthogonal. Who knows. Just crazy stuff. Late 2002. We're almost at the end now. 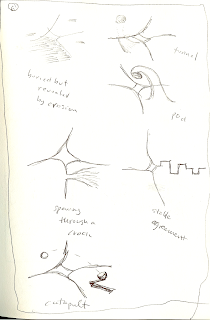 Here are some sort of Cynefin-on-the-moon doodles. 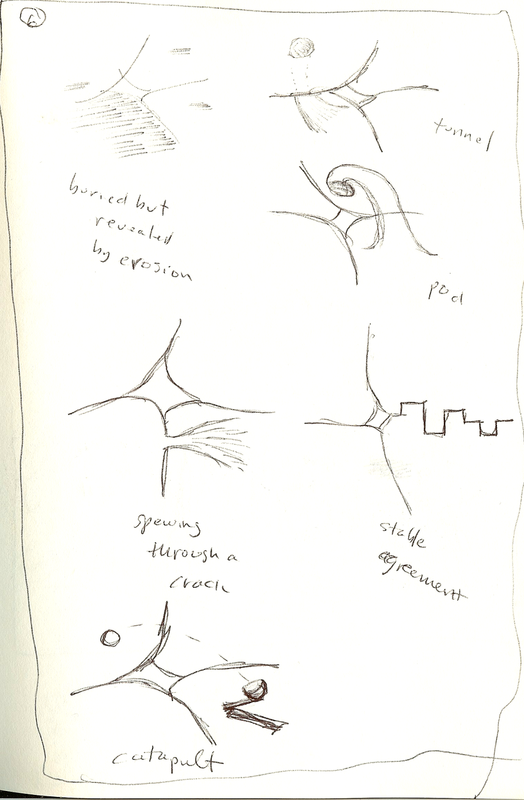 It says: "buried by revealed by erosion; tunnel; pod; spewing through a crack; stable agreement; catapult"
This was an idea about Cynefin unfurling, for some reason. Fable form. January 2003. 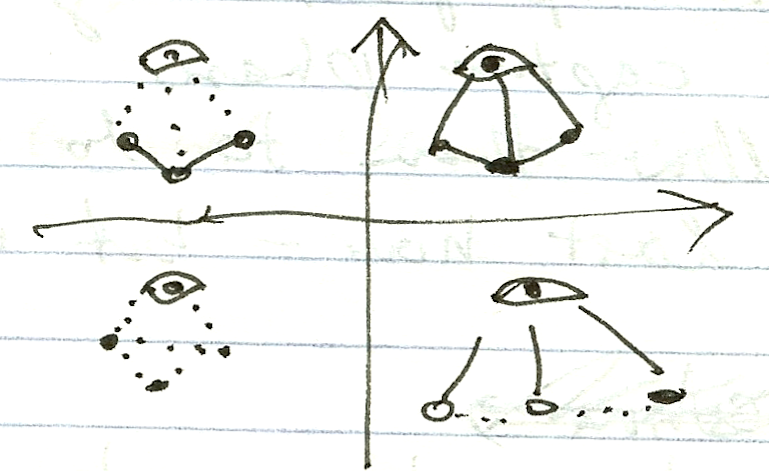 Here are some of my notes from the research project where I took apart something like 100 folk tales to figure out how we could use their structures to help people build their own stories. It says: "wise coalition; unwise coalition; deliverance or good luck (happy story); abandonment or bad luck (sad story); suspense; trial (general); trial (perseverance); trial (faith); good example; bad example; opportunity lost, folly; deception; journey (growth, learning from mistakes); simpler form; contrast (bad/good/bad); contrast (good/bad); paradox"
I had made up a sort of visual language to describe folk tales, and I used it to understand their parts and how they fit together. 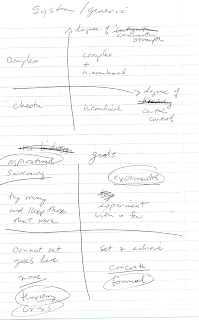 We were already using a story template in the story construction exercise, but this research made it possible to expand the possibilities of story construction enormously. I even created a prototype of a story construction software tool, for people to make sense of events by building folk tales out of their collected stories. 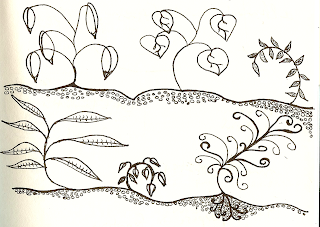 Let's have a doodle. Ah, that's nice. The middle space named. January 2003. 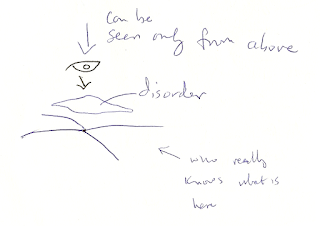 Here's a little snippet that shows how our thinking on the disorder domain was moving along. It says "can only be seen from above; disorder; who really knows what is here"
I think this may be around when Dave came up with the name "disorder" for the space. "Unorder" was my word, and "disorder" was his. Movements again. April 2003. 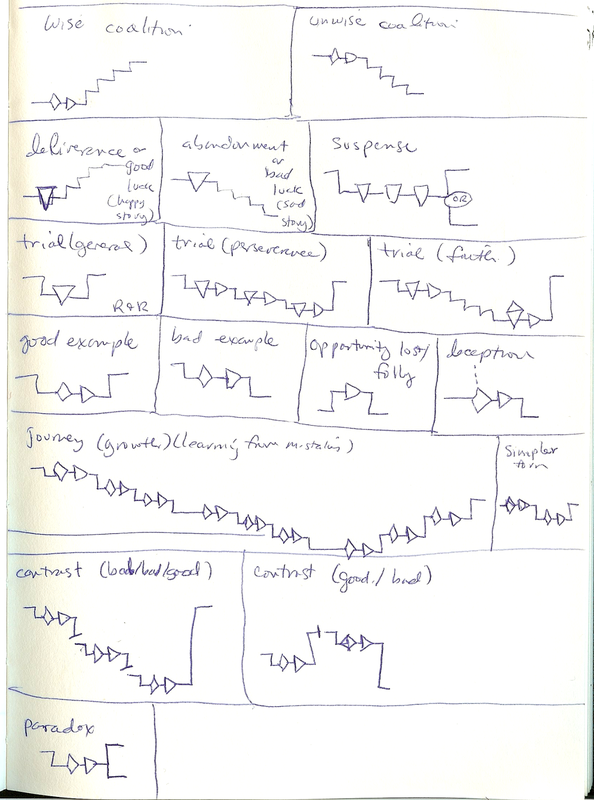 This is when we got very heavily into nailing down the movements among Cynefin domains for the IBM Systems Journal paper. 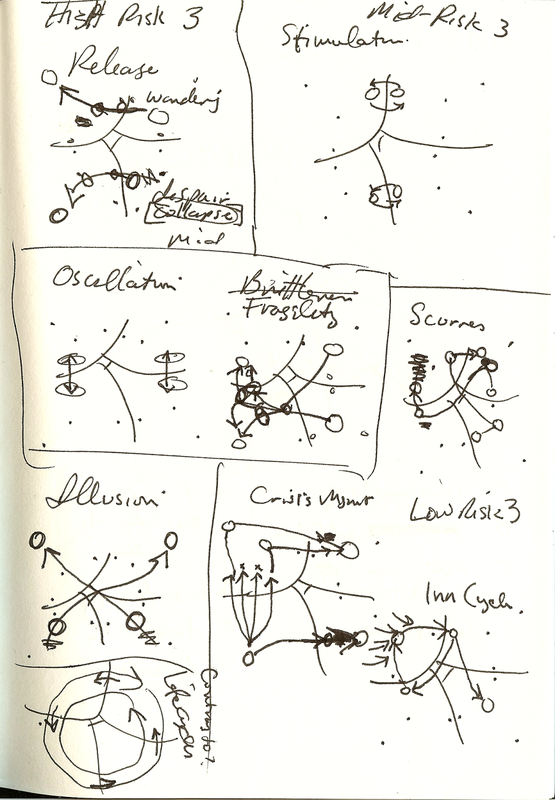 It says: "high risk: release, wandering, despair, collapse; mid-risk: stimulation; oscillation; fragility; S curves; illusion; crisis managment; low risk: (you figure that part out); life cycles"
By the way, a lot of people think that paper was written in 2003 because it was published in 2003. But its first draft was written in December of 2001. For a while the paper was very long, because we dumped a lot of current thinking into it (well, actually I did most of the dumping). Looking back now, it looks like the paper sat unchanged from April to December of 2002. 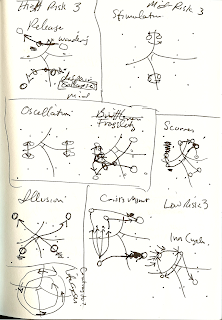 Then we came back to the paper and added the stuff about unorder and disorder; the sections on movements; and the section on the workshop technique where the model is derived. Because the ISJ wanted a short paper, we had to remove about 75% of the previous content, some of which I reused in other writings later on. Also, incidentally, because the ISJ reviewers objected to our use of the term "model," we changed the name of the thing to a "framework." I don't think it matters much. Okay folks, that's all the pictures I thought you would like to see. Hope you had fun looking through the notebooks with me. 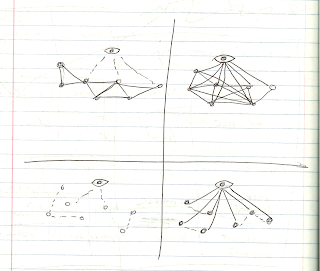 I'll leave you with a final doodle, which captures my thoughts about complexity, and about collaboration.